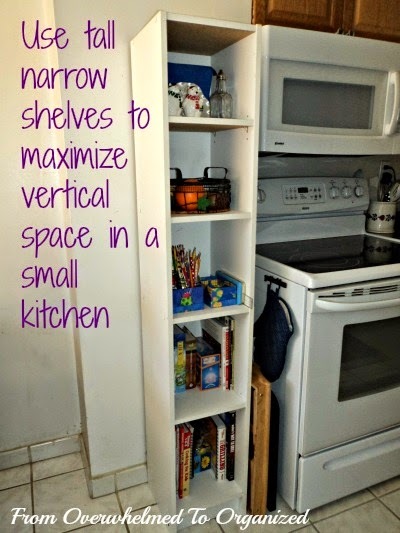 See how many times I've mentioned maximizing vertical space? 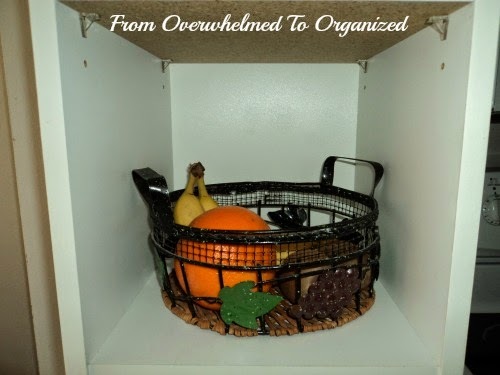 Definitely key to organizing your kitchen! Especially if it's small. I don't have a before picture of this shelf unit. I'm not sure why I didn't take one, but I've been decluttering this unit off and on for months now. 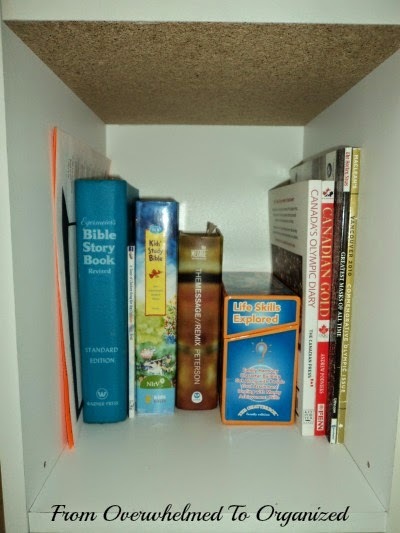 There was really only 1 shelf that we used regularly and that was the shelf with a few Bibles and family discussion activities. 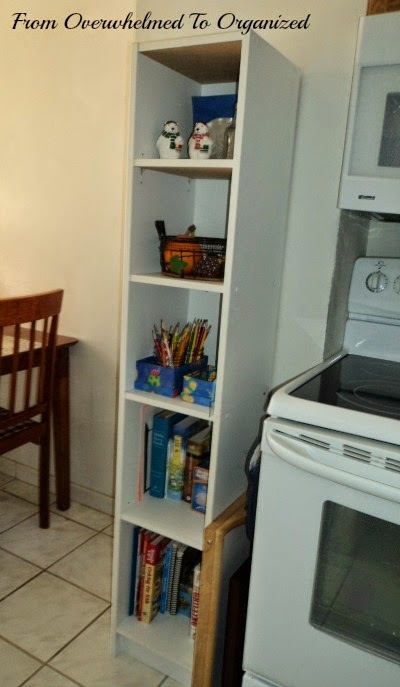 The rest of this unit used to be full of books that we rarely read and cookbooks we hardly ever used. And a few dust-collectors decorative pieces as well as a few items we didn't know where else to put. Good description right? Just picture a bunch of cluttered, dusty shelves. Got that image in your mind? OK! Here's what they look like now. This little space is between our main kitchen and our breakfast nook, which is where our kitchen table is. These shelves fit perfectly here and there's a bit of space for some trays between the stove and the shelves. I decluttered a lot. 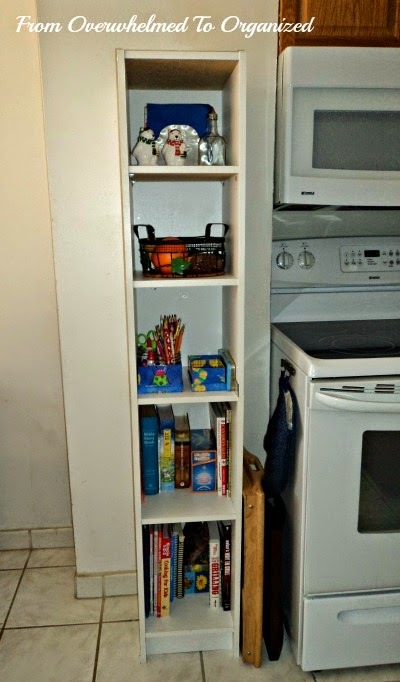 Those 2 shelves on the bottom with books used to be 4 shelves. And I relocated or purged some candles and knick knacks. That left me with 3 empty shelves! The top shelf is for our napkins and a few commonly used condiments/seasonings. The napkins used to be in a basket on our counter with some potholders and oven mitts. Part way through this organizing process, I moved that basket off the counters and onto a shelf. 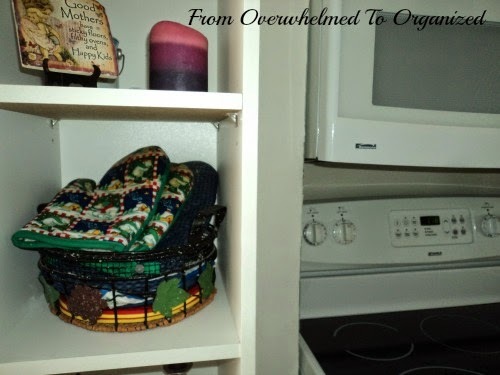 You may recognize this picture from my decluttering kitchen counters post. 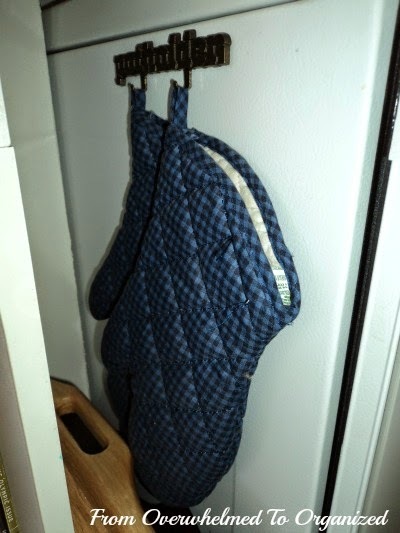 It worked having this basket here for awhile, but then I got a cute magnetic potholders hook from my mom when she was downsizing and it's hanging on the side of the stove with our oven mitts (more use of vertical space!). I tossed the other set of oven mitts because they were getting worn through (nearly burned my fingers one night!) So that didn't leave much in the basket anymore except napkins and a few hot pads. I relocated the hotpads and put the napkins in the napkin holder. Much better. The napkin holder even matches the tray I use for my hot beverage station, but it had been sitting in a drawer for quite awhile. I'm so happy we get to use it again. That freed up this basket for what it was originally intended for... fruit! This shelf unit is a good compromise. I see the fruit as I pass through the kitchen many times a day, it's at eye level for the kids (hoping that will encourage them to ask for fruit more! ), but it's not cluttering up my counters or my table. The next shelf is for homework supplies. Even though we keep plenty of supplies in the desk in our dining room, as well as the activity drawers in the dining room, and even though our dining room is right beside our kitchen, somehow pencils, erasers, rulers, glue, pencil crayons, and other school supplies seem to remain on surfaces in the kitchen after homework time. The kids usually work on their homework at the kitchen table so having these supplies on this shelf is really handy. I just put some of the most commonly used school supplies here (the ones they usually left lying around). Extras and less used supplies are still in the dining room. Which is still only a few steps away. Sometimes it's easier to organize based on where stuff lands, rather than where you think it should go. This was one of those times. Next is our Bibles and discussion activities shelf. It's pretty much as it was before, but I moved it down lower and combined it with a few other commemorative magazines (we don't have another bookshelf on the main floor, and we flip through these fairly often, so this is a good place to store them - much better than the living room table!). 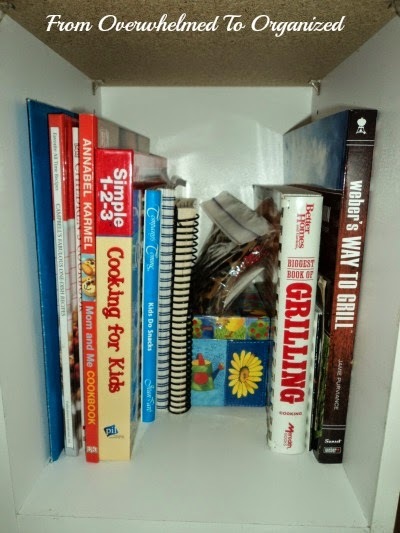 And the bottom shelf is what's left of our cookbooks and recipes. So are you ready to clear your counters and maximize the vertical space in your kitchen? 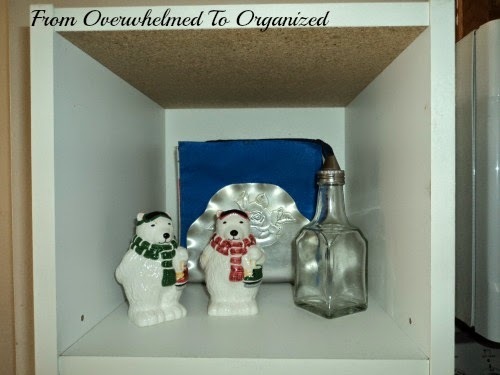 You can always find more kitchen organizing ideas on my Kitchen Organizing board on Pinterest. How do you maximize the vertical space in your kitchen? 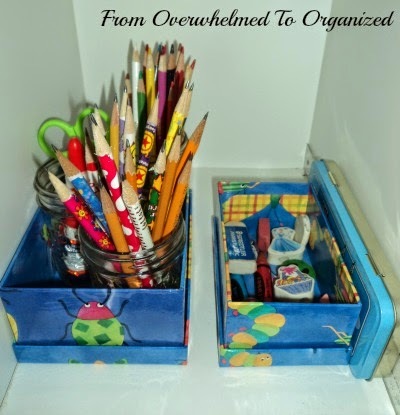 What's cluttering up your counters and how can you use vertical space to help keep them clear? Isn't that little magnet great? It took a few days to get used to the mitts being there, but I love how they're not taking up counter space or shelf space anymore! Can you add a hook to the side of your oven or on a nearby wall? Command brand hooks don't damage the surface when you take them off. Good luck! What a great way to add a great amount of storage. It looks great and I can see how useful that would be to have that right there in your kitchen / eating area.